While many British films take full advantage of the rural potential that “this spectered isle” can provide, there seems to be another sub-sect to this branch film, often finding its way into British horror cinema. Of course, this isn’t as clear cut as simply analysing films under the guise of “Rural Horror” or “Folk Horror” but there is a small batch of British horror films that make explicit use of the coastline. This doesn’t technically just mean by the sea; this is on the hilltop sides, the meadows leaning over sheer cliff tops, the beaches and sands, the pebbly vistas and the small villages that occupy the precipices of our land. Not all of the films mentioned within this article are from the horror genre though they capture the quaintness and strangeness of the landscape that is battered and worn by the adjacent sea and waves. The best starting point for this line of thinking is in the work of John Grierson whose short documentary pictures focussed explicitly on the fishing communities in Scotland. 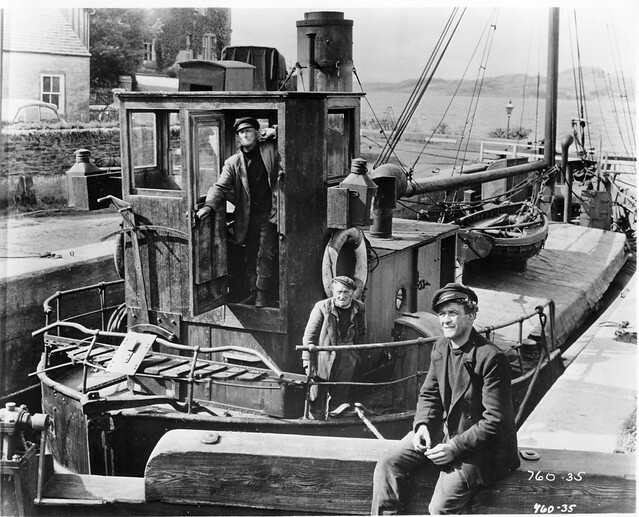 Though his most famous film, Drifters (1929), is largely filmed out at sea amongst the crashing waves, several parts focus on the small community that live to harvest the fish. This is more focussed in his shorter work, especially Granton Trawler (1934) which takes great effort in showing the more picture-postcard variety of fishing village. This is an aesthetic that would later be adopted into the purely horrific though is only one aspect of the strange coastline. Instead, this aesthetic would initially find its way more easily into films such as Ealing’s The Maggie (1954) and Whiskey Galore! (1949); both films that took great pleasure in meandering around the small fishing towns of Scotland alongside films such as Powell and Pressburger’s I Know Where I’m Going (1945) and an English equivalent in the opening segments of David Lean’s Great Expectations (1946). The first horror film to effectively move into this territory was Lewis Allen’s The Uninvited (1944), though its largely US studio filming almost negates its inclusion for no more than completeness. This sort of haunting coastline-lite can be seen in a number of Hitchcock films as well from his adaptation of Daphne Du Maurier’s Jamaica Inn (1939) to his Joan Fontaine double bill of Rebecca (1940) and Suspicion (1941). It took film until the late 1960s to see the full potential of a coastal horror even though the scenery had been vital to horror literature. In Bram Stoker’s Dracula, much is made of the villain’s first appearance on the British coast through his secret arrival in Whitby while M.R. James and Algernon Blackwood would often put their unlucky characters holidaying or exploring the Anglian coastline before unearthing some form of ungodly horror. Hammer were one of the first studios to properly use this horrific potential though were perhaps not the best exponents of it if only because of their obsession with filming everything within walking distance of Bray Studios. However, that didn’t mean that the films failed to reflect their coastal strangeness. In Freddie Francis’ Paranoiac (1963) and Joseph Losey’s The Damned (1963), both use the coastal areas they’re set within to explore dark ideas including madness, jealousy, government experimentation and weird culture while John Gilling’s double of The Reptile (1966) and Plague of the Zombies (1966), both set themselves on the Cornish coast even if obviously filmed largely near Slough. Other films around the same time began to see more in this potential. Roman Polanski’s Cul-De-Sac (1966) is so quintessentially based around Holy Island on Lindisfarne that it seems impossible to conceive the film without the seaside location. It’s implicit to the film’s narrative and there’s no doubt that the film would simply not work without the rhythms of the sea and the surrounding landscape dictating the fate and actions of the characters. This is truly the beginning of the era for strange British coastlines. 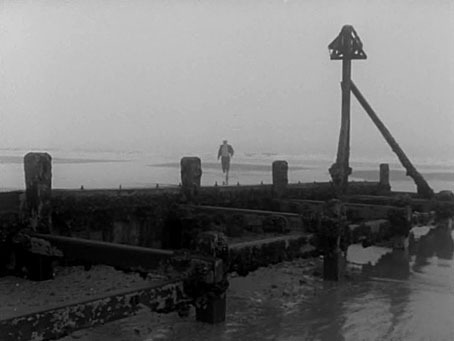 Coming back around to literature, the coastline began to become more ingrained the television horror of the era, the most effective of these being Jonathan Miller’s adaptation of Whistle and I’ll Come To You (1968). The film makes stark use of the crumbling landscape around the Suffolk coast, from cliff-top graveyards to desolate beaches. It’s almost Sebaldian. There are few films in this mold afterwards that aren’t somehow in its debt and this shows in Lawrence Gordon Clark’s adaptation of A Warning To The Curious (1972) which takes equal liberties with the coastline setting (this time filming in Norfolk). The seventies saw this theme come to fore like it never had done and probably never would do in the same way again. The coastline would become a place of strange experiments, weird occultism and isolated communities stuck on islands. In Peter Sasdy’s Doomwatch (1972), this is blatant with its island setting and scientific exploration being a wonderfully heady mix. The community presented in particular have all the rural clichés you could expect, further added to by their gradual mutation and mistrust of people from the mainland. Perhaps most famously, Robin Hardy’s The Wicker Man (1973) is the quintessential film of the strange coastline mould. Again set on an island, it makes more use out of its cliffs and beaches than perhaps any of the films mentioned. Even its final twisted moment is marked by a beautiful seascape view from the top of the cliff where the sacrifice takes place. Similar instances of this strangeness can be found in a number of British films including Fred Burnley’s Neither The Sea Nor The Land (1972) and Alastair Reed’s Something to Hide (1972). Even more art-house and big budget films from the era began to play around with the strangeness of the coastal landscape. Representing the former is Jerzy Skolimowski’s The Shout (1978); a film that stalks the sand dunes and hills of Devon with pleasure and ease. Visually, Skolimowski’s film epitomises the visual aspects of the coastline’s strangeness, placing the locale in an almost Roeg-esque sense of the weird. 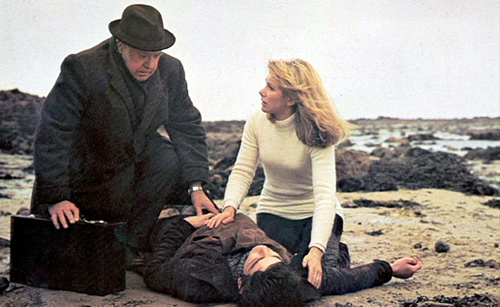 As for big budget films, Sam Peckinpah’s Straw Dogs (1971), while attracting more attention for its controversy, again makes the most of its Cornish setting and deserves more focus on Peckinpah’s grounding of the landscape than its violence. A few other films would occupy this strange realm but the trend would die back at least until the present day. The coastline would take a backseat as British horror likewise went into a relative hibernation of quality. It has taken films such as James Watkins’ The Woman in Black (2012) and Paul Wright’s For Those In Peril (2013), and documentaries such as Grant Gee’s Patience (After Sebald) (2012) to unearth the fruitful potential of the weird strangeness of our battered ragged coastline in the modern day; forever full of strange nooks and crannies waiting for the eeriness to crash along its sea cliffs once again. Coastal horror is definitely a rich and much under-discussed topic, coastlines by their nature already representing an ending of sorts. I have recently been thinking along these lines too but more on the idea of journeys and their intersections with the british coastline such as in I know Where I’m Going, Hunted (1952), Get Carter and Gallivant (1992) where the limits of the british isles seem to shape and describe their characters and by extension British identity and its limitations. I also really like the use of the Scottish coast in Margaret Tait’s Blue Black, Permanent. Recently watched John Smith’s Soft Work(2012) a film that exposes the coasts potential to stage tragi-comic existential despair as also witnessed in BS Johnson’s ruminations in Fat Man on a Beach(1973). Lovely comment with some nice link ins. I came very close to mentioning Get Carter but found it too industrial to be mentioned. Literature rather than film, I know, but I’m reminded of “The Breakthrough” by Daphne du Maurier (handily published as a mini Penguin Classic https://www.penguin.co.uk/books/308566/the-breakthrough/), which itself makes me think of Kate Bush’s song “Experiment IV”. The Music of Folk Horror – Part 1 (Sub-Genre Theories).